To promote understanding of global species biodiversity and conservation, World Wildlife Fund partnered with Blue Raster to launch an updated version of WildFinder. This online mapping application provides conservationists, educators, students and concerned global citizens with enhanced ability to study the global distribution of more than 26,000 species. WildFinder gives users the ability to visualize and investigate the world’s most comprehensive dataset of the geographic distributions of birds, mammals, reptiles and amphibians. Scientists have used WildFinder to conduct research that otherwise would have required a time-consuming search of hundreds of references. This interactive application provides the ability to search for wildlife by location, species name (common or scientific) and ecoregions. 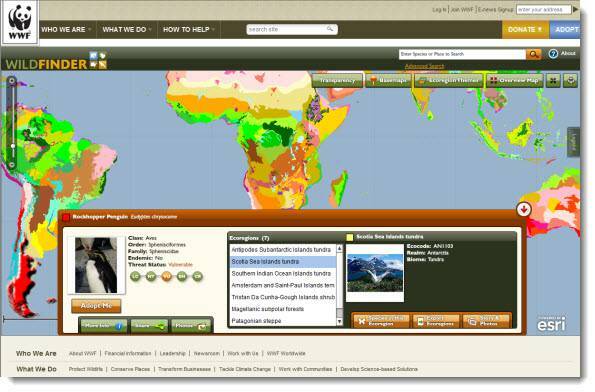 Users can explore a variety of thematic ecoregion maps such as terrestrial biomes, species endemism and richness, as well as freshwater and terrestrial rarity, providing geographic context to user queries. New features in this latest version of WildFinder include increased visualization and context for both species and ecoregions through photos from Flickr and Arkive, new thematic maps, details on ecoregions and updated threat status information for species. The application applies the technologies of ESRI ArcGIS Server, Oracle, and Adobe ColdFusion as well as the Flickr and ARKive APIs.